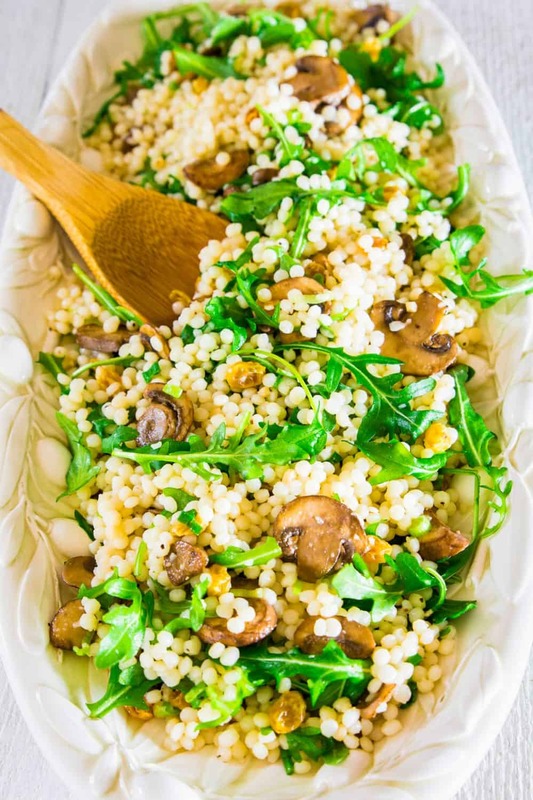 Israeli couscous combined with sautéed balsamic mushrooms, golden raisins, and fresh arugula, makes the perfect spring/summer salad. Although couscous is technically pasta, this salad is not heavy at all. 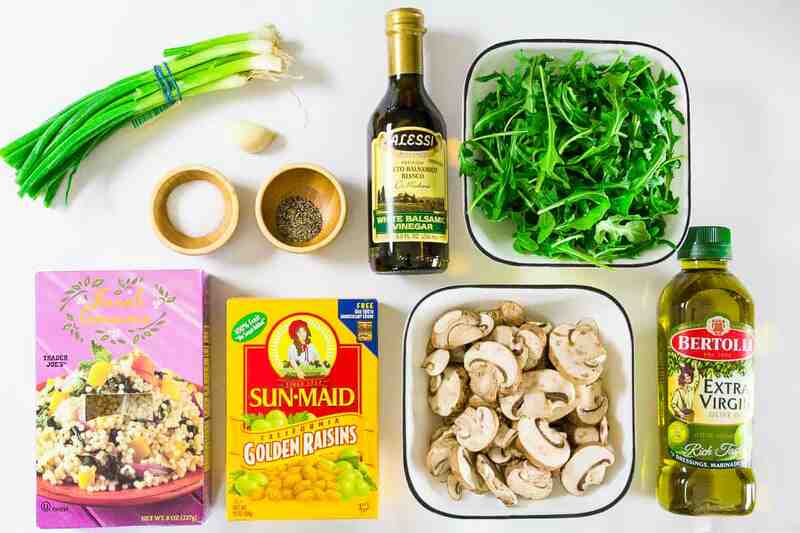 The fresh arugula and white balsamic vinegar give it such a fresh and vibrant flavor. I like to make this salad a few hours before serving so the couscous has more time to soak up the flavor, but if you can’t wait a few hours, I don’t blame you. It’s too good to wait for! 1. Soak the raisins in hot water for 30 minutes. 2. Sauté the mushrooms until they soften. Then add the minced garlic and 2 tbsp white vinegar. Sauté for another 2 minutes. 3. Cook the couscous according to the package and drain out the water. 4. 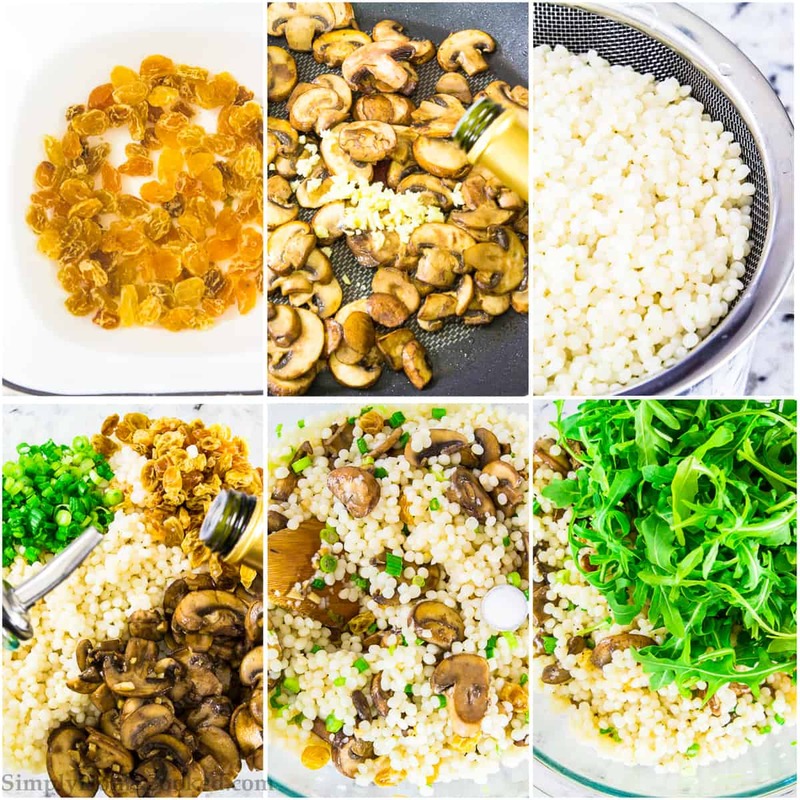 In a large bowl, combine couscous, raisins, green onion, sautéed mushrooms, 4 tbsp olive oil, and 2 tbsp white balsamic vinegar. 5. Then add salt, pepper, and arugula. Toss to combine. Serve chilled. Soak the raisins in hot water for 30 minutes. Sauté the mushrooms until they soften. Then add the minced garlic and 2 tbsp white vinegar. Sauté for another 2 minutes. Cook the couscous according to the package and drain out the water. 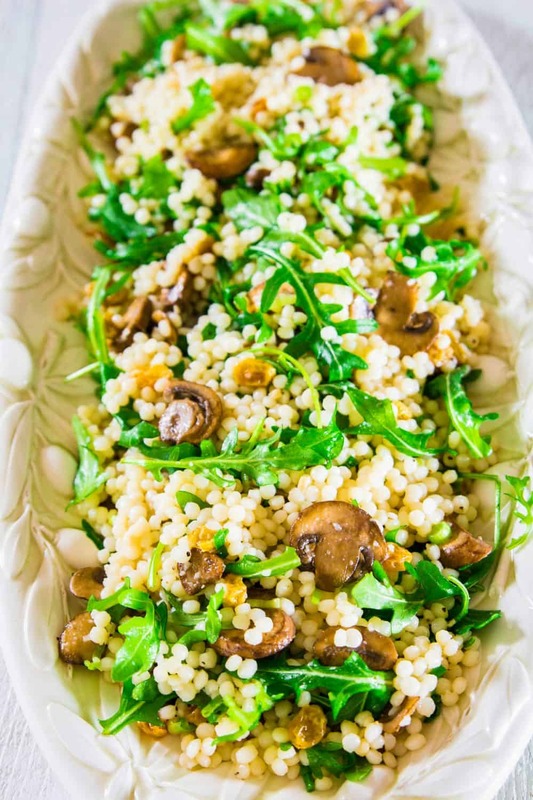 In a large bowl, combine couscous, raisins, green onion, sautéed mushrooms, 4 tbsp olive oil, and 2 tbsp white balsamic vinegar. Then add salt, pepper, and arugula. Toss to combine. Serve chilled. Just want to know maybe you have a tip. Hi Julie, which type of couscous did you use? There is a little difference between plain couscous and Israeli couscous. Great recipe! My family loves it.